Covered in intricate filigree, a beautifully hidden gate in the garden wall leads to a secluded oasis. Among the flourishing trees and flowers, the striking damselfly powerfully flits within the realm of the captivating secret garden. 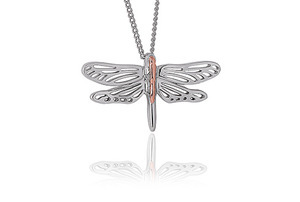 The delicate sterling silver Damselfly pendant is adorned with rose gold containing rare Welsh gold.